This article originally featured on Defencyclopedia and is republished with permission. It may be read in its original form here. 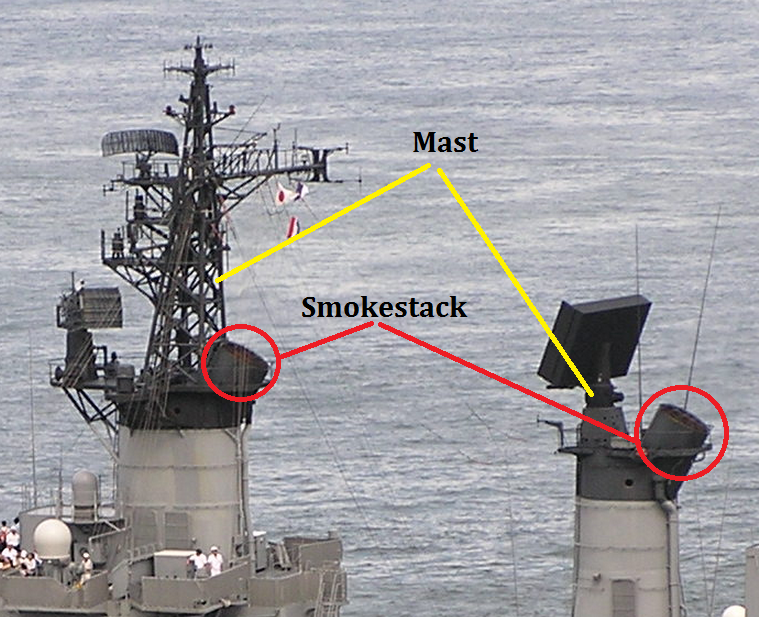 The best position for a sensor on a ship, is on top of the highest mast. Multiple sensors mean multiple antennas; hence ending up close together. Such an arrangement requires the need to switch one system off before another one can be used. As all sensor systems are installed separately on the ship, and then subsequently integrated and tested, they add considerably to the time and cost required for building a naval vessel.With recent development of integrated masts for warships, gone are the dozens of antennas and sensors found on practically every flat topside surface of a modern naval vessel. These integrated masts allow the exploitation of modern materials and technology to improve sensor performance and coverage with pre-outfitting, leading to reduced cost of construction due to reduced time overruns. 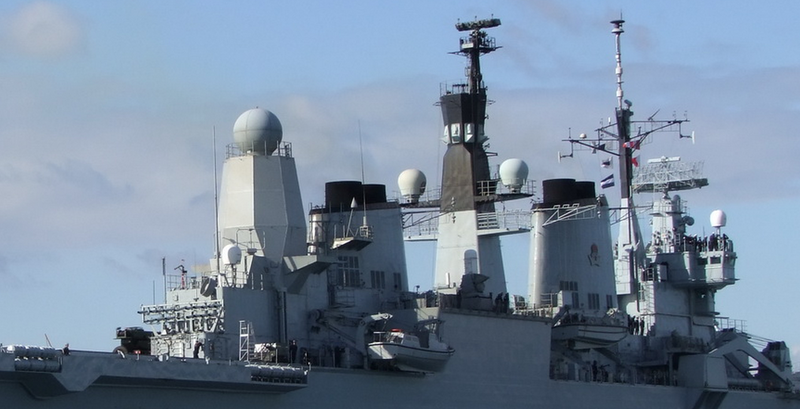 This article, by Commander Nitin Agarwala, who is now a contributing author for Defencyclopedia, explores the developments in integrated mast design for integration of electronic warfare (EW),communication and Radar and their future in warship construction. 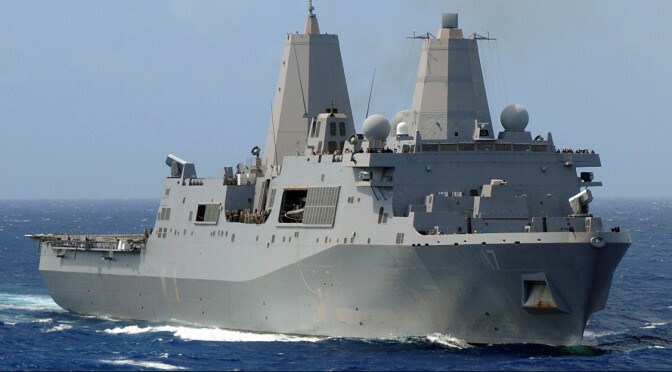 How does an antenna become designated for use in navigation, weapon fire control, communications, electronic countermeasures or for any other reason, and ultimately installed on board a Naval surface ship? The answer should be, it’s part of the antenna design procedure. Though the answer is simple, the process is not. There was a time, when this design procedure, referred to as dart-boarding, was based on an educated guess for the most feasible layout of the antennas, followed by experimental verification. As the reliance on electronic systems such as communications, radar,navigation, gunfire control, friend-or-foe identification, electronic countermeasures, and aircraft operations increased, one realized that complex, intricate below-decks electronic equipment was virtually useless unless matched with satisfactory antenna performance. Hence former methods of antenna design and topside arrangements were no longer adequate and dart-boarding disappeared – to be replaced by careful scientific planning. These electronic systems divided the shipboard antennas into three broad groups. Omni-directional antennas – used mainly for communications, air navigation, and passive reception. These satisfy the need of ships and aircraft to maneuver independently of each other and fixed radio stations. Directional antennas – used for transmitting and receiving spatially concentrated energy in one direction at a time. These are used for radar, gunfire control, and satellite communication to obtain information about or from remote objects. Directional antennas – used to determine bearing of incident radiation; and is used primarily for direction finding navigation and Electronic Countermeasures (ECM). 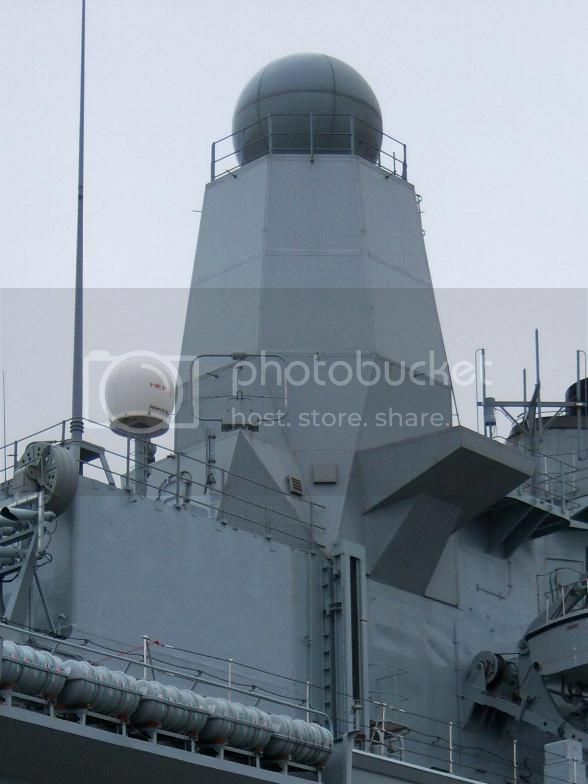 For an operational naval platform, the basic minimum required sensors are communication antennas from HF to UHF, navigation radar, surveillance radar, IFF, Fire Control Radar, ESM, jammers, electro-optical sensor systems and missile up-links.Providing these large number and variety of distinct services on the antenna in the extremely restricted space presents many very-difficult and different problems which do not arise in other technical disciplines. Clustering of so many antennas in so little space,plus the necessity for simultaneous emission and reception together with the undesirable, but unavoidable, electromagnetic coupling to, and re-radiation from, a host of other shipboard metal objects, results in a most trying system integration problem for the ship. Strenuous efforts must be made to reach a compromise with all competing topside subsystems so as to provide the least degradation in overall performance. The various types of masts have been a result of changing requirement of the navies and the developing technology used over the years. Of all these masts, a plated mast, even with a higher weight than a lattice mast, is preferred in most cases due to its advantages of lower radar cross-section, improved through life maintenance (due to enclosed structure), lesser vibration and ability to handle larger weight of modern equipment. 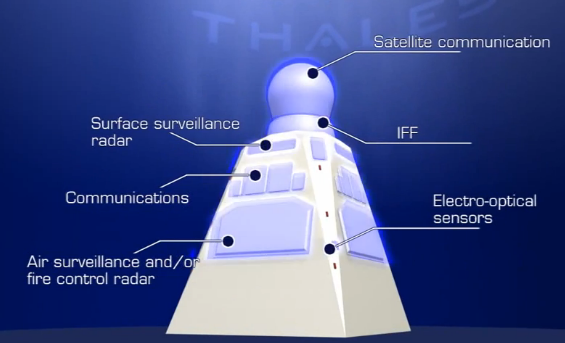 The design of the mast however is not limited to just the placement of thesensors.The mast design has a direct bearing on the design of the vessel itself as its weight will impact the stability performance, air resistance will impact the ships speed and the arrangement of the antennae will affect the top side electromagnetic environment and RADHAZ (radiation hazard). When designing, one needs to structurally integrate the mast to the ship to ensure strength due to both static and dynamic loads (whipping loads due to hull slamming, air resistance, shock), provide access, power and cooling air and study the effect of the heat plume from the exhausts/funnel impinging on the antennae. 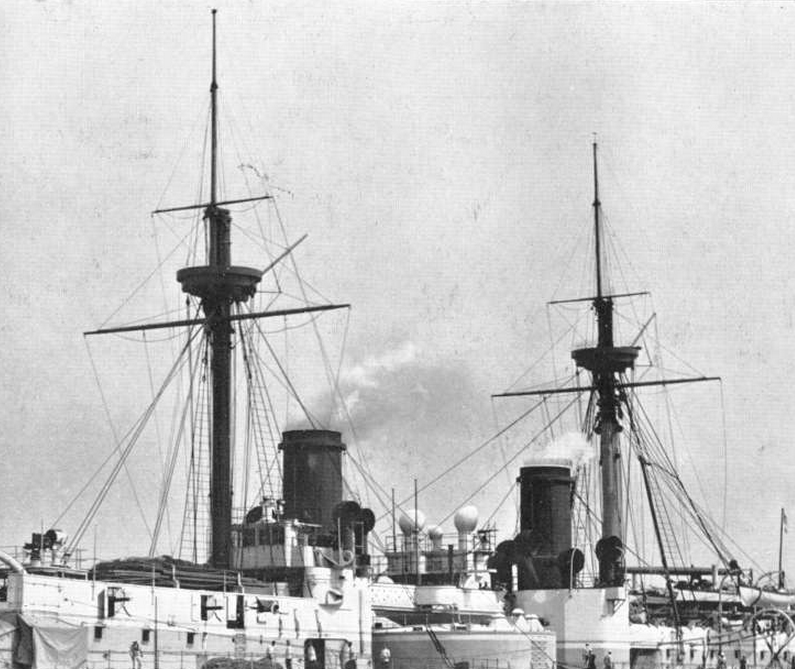 The picture of HMAS Perth shows the effect of proximity of the smokestack to the masts on the ship. 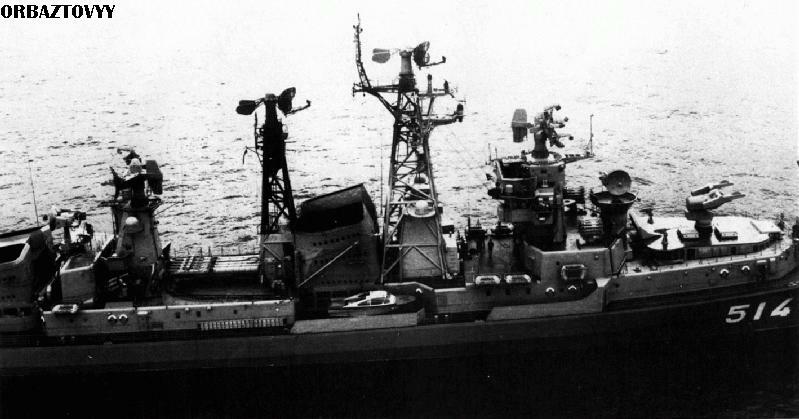 Conventional warship masts are plagued with a variety of downsides which include large amounts of steel making the ship topside heavy resulting into weight penalty, expensive maintenance due to exposed sensors, wooding as a result of sensor / mast interactions, electromagnetic induction due to spurious reflections and poor screening and impingement in return causing a high radar signature. This has led to designers looking at alternatives. 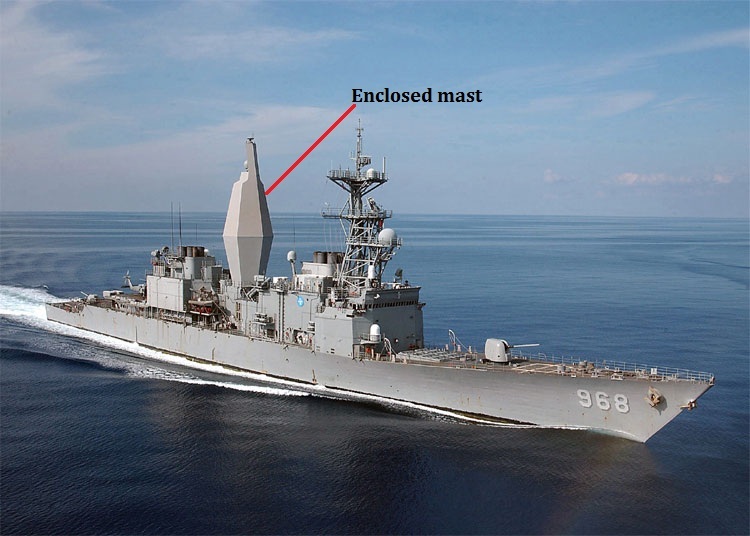 The Advanced Enclosed Mast/Sensor (AEM/S) system designed by the US and initiated in 1995 is a hexagonal (used onboard USS Radford DD-968) or an octagonal (used onboard U.S.S. San AntonioLPD-17) structure. It encloses the existing radar and other sensitive equipment,protecting them from the environment thereby reducing maintenance requirements. The lower half of the AEM/S system serves to hold up the top half. The case of the lower half is balsa. An electromagnetic (EM) shield compartment that uses reflecting metallic shielding is included in a portion of the lower half of the mast to meet design requirements. The top half contains a tailored sandwich composite material made up of a foam core, with frequency selective material, as well as structural laminate skins. 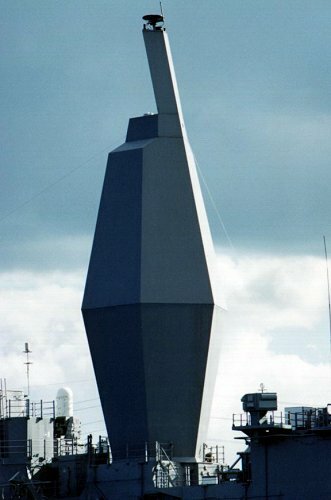 The Advanced Technology Mast (ATM) designed by the UK, comprises of a steel substructure clad in advanced fibre reinforced plastic (FRP) composite panels,which incorporate radar-absorbing layers. Sensors are installed in interchangeable modules mounted within the cladding. 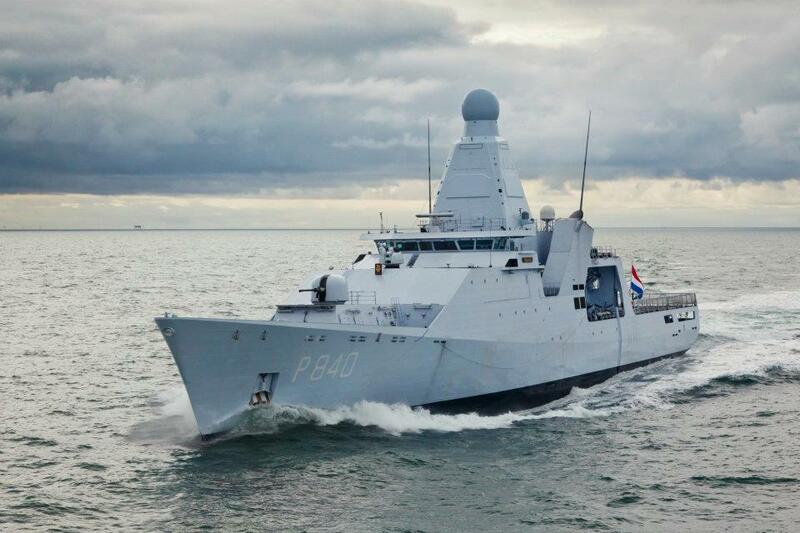 The philosophy of the mast is intended to support future surface warship designs and retrofit to existing ships. The sensors and radio equipment are completely enclosed in the radar reflective mast structures. The masts look like unstayed pole masts with very large rectangular cross-sections, tapering from the base to the top. The Integrated mast (I-MAST) designed by Netherlands, is a completely different design approach from the traditional sensor layout. 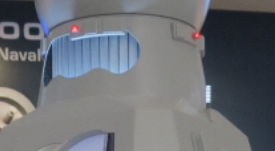 This mast type integrates the sensors into the structure itself. One central mast structure houses the radar, optronic, and communication sensors and antennas as well as all cabinets and peripherals. The Integrated Mast concept improves the undesirable situation of having to equip a ship with sensors and antenna after she has been completed in full. In the I-Mast, the mast and the equipment are built and tested while the ship is under construction. 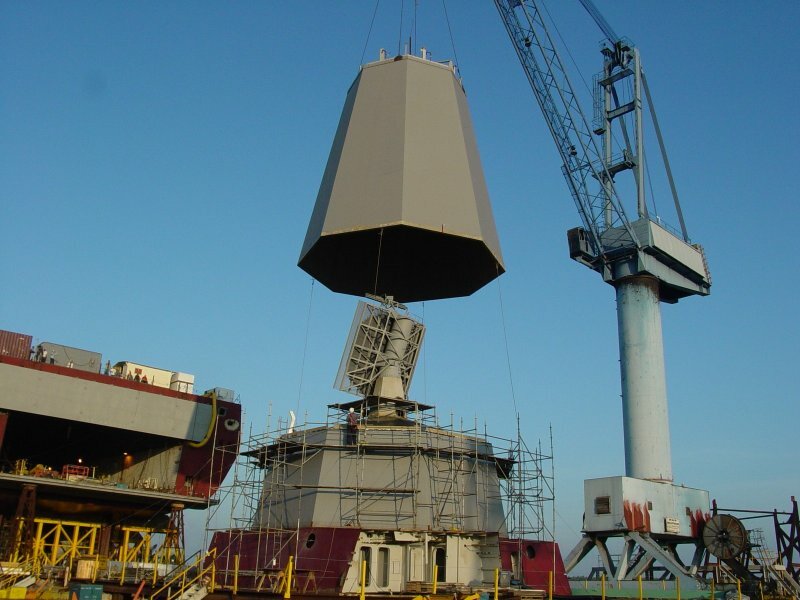 When the ship is ready, the mast is put on the ship as a turnkey system. It has a comparatively simple interface to the ship’s power supply, cooling water supply, combat system, and mechanical deck structure, making installation a plug and play operation. The mast itself is a fully air tight module forming part of the ship’s citadel, providing environmental protection against shock, blast, vibration, solar radiation,temperature, uptake efflux, electromagnetic radiation and chemical, biological, radiological or nuclear weapons. 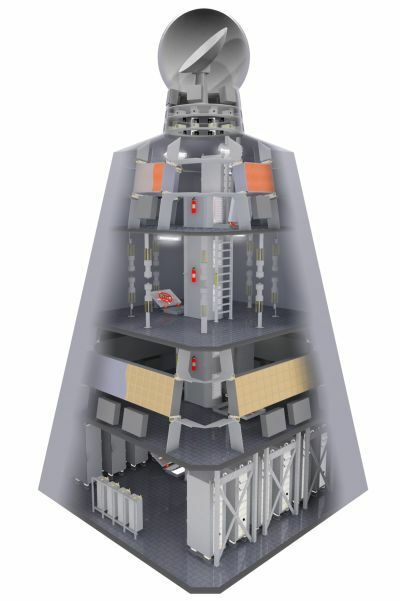 An external load-bearing steel structure has been adopted to facilitate the integration of different types of sensors and communications, with equipment arranged over four deck levels (a top deck,upper antenna deck, lower antenna deck and an equipment deck. A shielded duct or “backbone” routes cabling and cooling circuitry up through the centre of the mast to serve individual equipment. 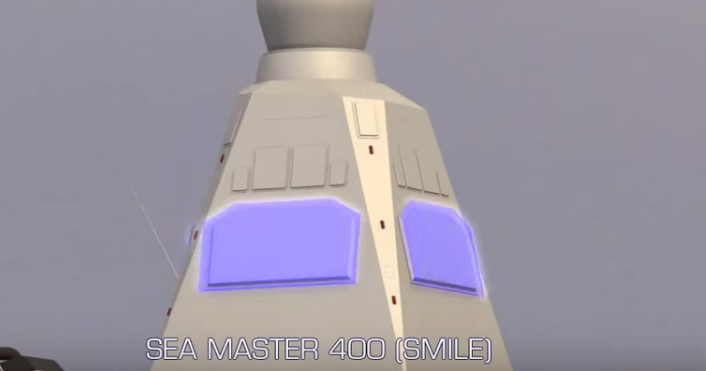 SeaMaster 400 (also called SMILE) is a non-rotating S-band radar with four faces for air and surface surveillance. It is derived from the proven SMART and APAR radar systems. SM400’s unique concept of multi-beam volume search with four active scanning faces ensures the simultaneous performance of all operational tasks at a high update rate and very low false alarm rate. SM400 also provides helicopter direction and approach capabilities and has three fire control channels. The system’s high number of parallel transmit and receive channels provide a high degree of redundancy. Seawatcher (also called SEASTAR) is a four face non-rotating active phased array X-band radar for naval surface surveillance. The high resolution system automatically detects and tracks asymmetric threats and very small objects such as mines, periscopes. Seawatcher can also be used for helicopter guidance. 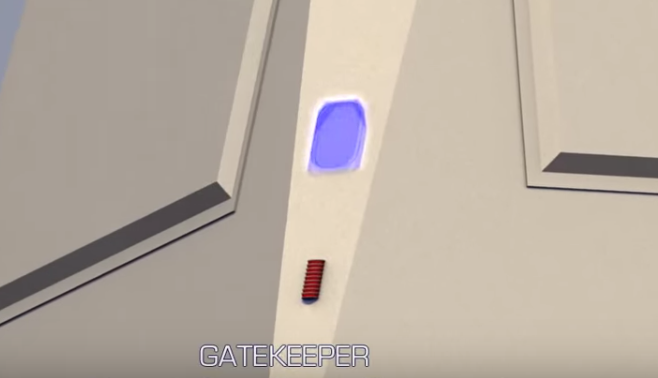 Gatekeeper is a 360° panoramic electro-optical surveillance and alerter system based on IR/TV technology. Designed to counter emerging asymmetric threats down to small boats and swimmers, Gatekeeper increases short-range situational awareness in littoral environments. 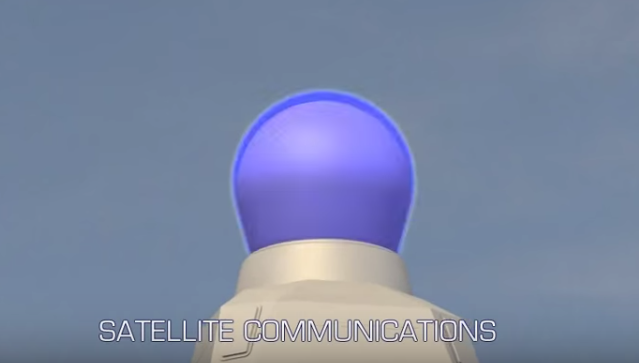 The Integrated Communication Antenna System (ICAS) facilitates the use of standard VHF / UHF communications equipment, is fitted with Link 16 integration, provides excellent transmit/receive isolation, offers estate for auxiliary antennas such as GSM/GPS and is designed for future growth. The non-rotating Identification Friend or Foe (NR IFF) uses a cylindrical array fitted to the top of the structure. It is designed to operate with standard interrogator/transponder systems. It is optimized for operation with a non-rotating primary radar. Littoral environments are extremely complex given the high density of natural and man-made clutter, crowded commercial air and sea lanes, vehicle traffic along the coastline, and the effects of anomalous propagation on sensor performance. To further complicate the problem, recent years have seen the emergence of an increasingly“asymmetric” threat set (unmanned air vehicles, fast inshore attack craft, gliders, dinghies, swimmers and mines) that are intrinsically difficult to detect in high clutter backgrounds. To resolve such issues the concept of an integrated mast incorporating the principal surveillance sensors and communication systems has evolved. 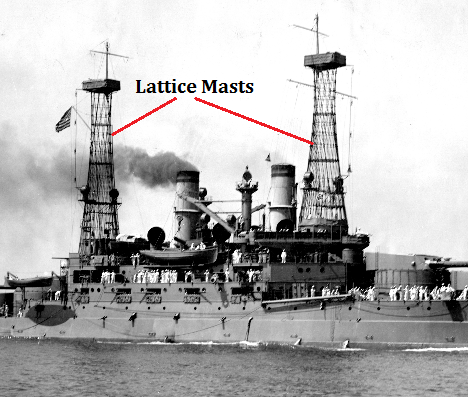 By resolving the electromagnetic conflicts and line-of-sight obstructions inherent to traditional topside antenna arrangements, the integrated mast aims at delivering an unobstructed field of view, reduced cross section; ease of electromagnetic friction and to simplify shipboard integration. This in return provides a significant benefit in terms of improved operational performance and availability, shorter shipbuilding time, reduced maintenance requirements and significant savings in below-deck volume. Various advanced Mast designs have been produced in the recent past which have been discussed in this paper. All of them have been tested for their structural performance against both environmental and shock loads. One can say with confidence that today the concept of “integrated mast” has become a reality from just a technology demonstration project. Though it is definitely a product which shall become an integral part of the future ship design, however many issues such as the impact of the integrated mast on ship design need to be studied in detail. One needs to also study issues such as material selection for the mast, access arrangements and structural integration and stability as key aspects among many. Finally the integrated mast designers themselves will continue to be challenged by how to design a mast or series of masts that offer a solution that is sufficiently flexible for fit to a variety of vessel sizes and satisfy differing customer requirements. Commander (Dr) Nitin Agarwala, a serving Indian Naval Officer commissioned in 1993, is a Naval Architect from Cochin University of Science and Technology and an alumnus of Indian Institute of Technology, Delhi and Kharagpur. The officer has experienced the various facets of a warship as a user, inspector and a maintainer. He is now a part of the design team of naval warships. He has published over 26 papers in various conferences, and journals of national and international repute. His areas of interest are Wave structure interaction problems, Acoustic structure interaction problems, Hydroelasticity related ship structure problems, Corrosion problems associated with ships. Commander Steve George was the Deputy Aircraft Engineering Officer 820sqn RNAS, Sea King squadron on HMS Invincible in the Falklands War. He provides a strong overview of the engineering challenges posed to aviation in the 1982 Falklands War. He has had a long career since, and included work on the F-35. 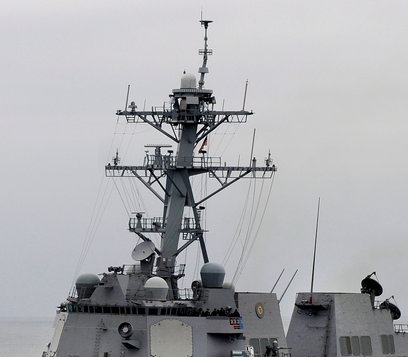 The U.S. Navy looks set to lead a bit of joint maritime innovation experimentation in February. According to the U.S. 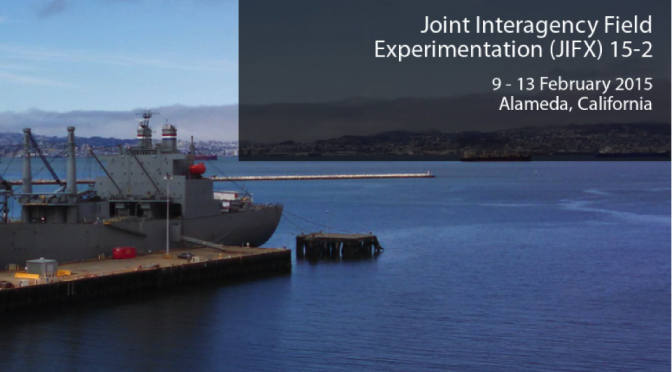 Naval Postgraduate School (NPS)’s Joint Interagency Field Experimentation (JIFX) Program website, the latest interagency field experimentation , set to run 9-13 February, will have a maritime setting and focus. NPS will host “JIFX 15-2” at the Department of Transportation’s Maritime Administration Facility in Alameda, CA, in a port facility and aboard a military cargo ship. Per the primary request for information from NPS, people wanting to conduct experiments on “any and all technologies relevant to the maritime domain” were encouraged to apply. While the initial deadline for such applicants has past, those looking to attend as an observant can still do so here until 04 February. Deployed Infrastructure Building and Maintenance. Support building partnerships and stability operations through building infrastructure capabilities. Ability to reduce time and money spent increasing safety and operational capacity. Areas of interest include solutions that can assist in dust abatement, forward operating base maintenance with roads, runways, tarmacs construction & repair, expeditionary shelter support and efforts addressing fortification and ballistics. Using non-specialized equipment needed for most applications, rapidly deployable and customizable to the region of operations as needed. Deployable Lighting Technologies. Light Emitting Diodes (LEDs) are preferred. Potential solutions would be blackout capable and would be easily camouflaged for stealth day/night operations and would need to be ruggedized for all weather use and minimize energy requirements. Energy efficiencies. Solutions sought will explore renewable energy sources for mobile and austere environments; reductions in fossil fuel consumption; fused sources including diesel, wind, solar, etc. ; energy saving technologies for shelter, transportation, and portable IT systems (to include DC systems, chill water cooling, ambient cooling, cloud computing); alternative shelters and HVAC (heating, ventilation & air conditioning) systems that address a reduction in energy needs, deployable field feeding systems that take into account weight, size, and avoid fuel-fired cooking appliances; deployable self-sustaining waste-to-energy systems capable of handling approximately 1 ton per day, fit into a 1/3 of a 20ft ISO container, and with no hazardous emissions. Water Generation and Purification Systems. Solutions other than commercially procured bottled water and current Reverse Osmosis Water Purification Units (ROWPUs) are sought. Potential solutions might include atmospheric water solutions, black & gray water re-use systems, and new reverse osmosis technologies that incorporate reductions in energy demand. Safe (non-propagation/non-flammable) Lithium batteries or any related technologies (underwater submersible or like-type platforms). This post was originally published on the Blue Value Facilities Engineering Blog and was re-published by permission. At Naval Undersea Warfare Center (NUWC) Newport we recently began an internal investment project—the Seamless and Intuitive Warfare Workforce Development Project—to develop the next generation of “system of systems” engineers. These engineers will ideally be trained to view problems and develop solutions in a holistic manner, breaking from the stove-piped designs of legacy systems. As an underlying theme for the effort, NUWC Newport focused on the “One System” vision for submarine tactical systems. 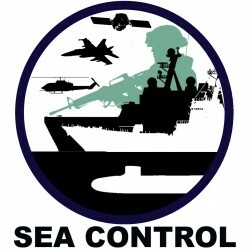 This idea was originally conceptualized at the Tactical Advancements for Next Generation (TANG) forum and further advocated by the submarine fleet. In pursuit of this vision, the team explored potential improvements for submarine combat system interfaces and for the control room as a way to improve the information flow and the effectiveness of the control room’s contact management team. Team formation: We recruited and selected a cross-departmental team of 10 young engineers, typically with 3-7 years experience, from the Sensors and Sonar Systems, Combat Systems and Electromagnetic Systems Departments at NUWC Division Newport. Baselining on current combat systems: We cross-trained the team using military personnel in the Combat Systems Collaboration And Fleet Experimentation (CAFÉ) laboratory on an end-to-end layout of a Virginia-class ballistic missile submarine (SSBN) control room, driven by a Submarine Multi Mission Team Trainer (SMMTT) system with sonar and combat control watch teams. An imaging simulator was even used to populate the periscope view with surface contacts when operating at periscope depth. 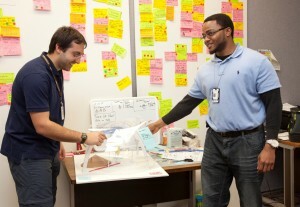 Innovation process: The team brainstormed initial concepts for next-gen integrated tactical systems, generating around 40-50 ideas, from which about 8 concepts were selected by the team for early prototyping with mock-ups. These mock-ups were cut-out model representations using basic materials such as foam-core, cardboard and coloring sheets; and served to focus the team’s attention on details of scale and placement that would not have otherwise occurred. Today’s Sailors are accustomed to immersive video games, advanced smart phones and tablets, intuitive multi-touch applications and can easily navigate the highly networked and always-connected world in which we now live in (so-called ‘digital natives’). Our project aims to leverage this natural affinity coupled with advanced technologies such as high resolution multi-touch displays, and mobile computing devices, and new software concepts such as cloud computing and virtualization and apply them to the demanding needs of the tactical warfighter. Sailors should be able to seamlessly adapt their high-tech civilian skills to the world of Undersea Warfare with minimal re-training and Seamless and Intuitive USW is focused on making this goal a reality. The innovation process we followed was modeled after one developed by design and innovation consulting firm IDEO; the same process used by the TANG workshop. Generating a series of “How might we…” questions (called HMWs), the group brainstormed ideas for what improvements could be created. The members of the brainstorming group then came up with ideas to answer the questions (e.g. “redesign the layout of the control center!”) and wrote their ideas along with descriptive pictures to better explain the idea on sticky notes; one idea per sticky. Emphasis was on rapid and not necessarily well thought-out ideation along with quick sketches for each idea. 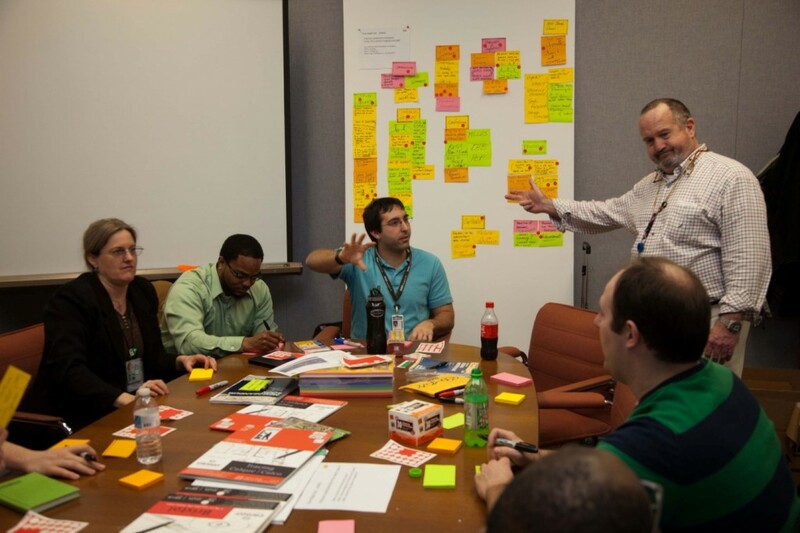 The fast-paced nature of this exercise kept team members excited and stimulated creativity. After investigating each idea, the group voted on the ideas they found most interesting, most powerful, or most disruptive. Sub-groups of 2-5 team members were formed, and each sub-group picked a high scoring response to a HMW question that they would like to prototype. This stage of prototyping was very basic; 4-K displays, iPads, iPhones, Android tablets, cloud computing, and multi-touch monitors took a back seat to foamcore, construction paper, hot glue, whiteboards, Sharpies, and dry erase markers. The immediate goal wasn’t to get an actual product out to the fleet—rather to build a better mental model of the top ideas before laying the groundwork for an actual system. Some of our prototypes at this stage included an operator workstation stack built out of foamcore, models of how we envisioned the layout of futuristic control rooms built from construction paper and foamcore (complete with popsicle stick sailors), and a 3D-display made from transparency sheets and foamcore. Building rough prototypes literally turns words on paper into tangible objects. Tangible objects are easier to work with since they do not require the imagination of onlookers and fellow team members. A 3D-display may seem unnecessary until a fellow team member shows a physical model with a clay “ownship” submarine at the center and contacts of interest at various ranges and bearings on the display, directly modeling the actual tactical picture in the current environment. From here our Seamless & Intuitive USW group branched out in two directions; software application development and virtual worlds (VW) modeling. The “App Team” focused on taking the most promising and realistic rough prototypes (in terms of team skills and project timeframe) and prototyped them in an actual software environment. This year we had access to a Perceptive Pixel multi-touch workstation with the Qt development environment that enabled us to quickly put together a few simple applications to interactively demonstrate the same concepts we prototyped using the arts & crafts materials. One example was a “Multi-touch App Manager” which allowed a user to pull open a menu of “available apps” similar to the app icons on Android or iOS, and resize and drag individual “apps”—simply static tactical screenshots in our prototype—around the workspace. Other examples included a demo of three different ways to select a trace on a display and a “Five Finger” multi-touch menu that enables users to pull open an intuitive menu simply by placing their right or left hand on the display surface. Some of the ideas we brainstormed couldn’t adequately be represented in software. 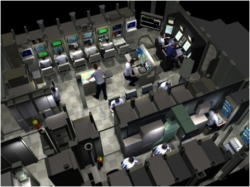 Rather than build a full-sized model submarine control room, the other branch of our group, the “Tiger Team,” employed their modeling skills with Second Life, a virtual world simulator. 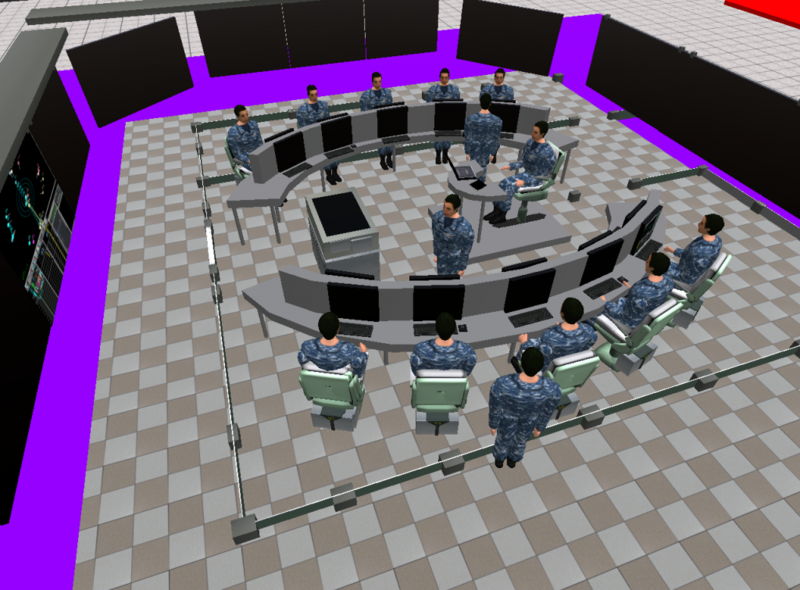 The Tiger Team worked with the “Virtual Worlds” group at NUWC, a team with expertise in creating realistic virtual models of Navy ships, submarines, and facilities in Second Life. The Virtual Worlds group assisted the Tiger Team in building realistic models of concepts such as new control room layouts, next-generation displays (such as the previously mentioned 3D-display), and even interactive displays by utilizing Second Life’s VNC capability (see below for an inward-facing command center configuration). “But now they can all see when I’m updating my fantasy football team!” Futuristic Command Center conceptual layout in Virtual Worlds. The next step from here is implementing these prototypes on live data-streams, and integrating them as advanced engineering modules into a tactical system. So far we have given various demonstrations of our concepts, and have received overwhelmingly positive feedback from our colleagues, internal NUWC management, and fleet representatives from Submarine Development Squadron TWELVE at the annual DEVRON12-NUWC Tech Exchange. The simplicity of the design-thinking process allowed our small team of engineers to go from ideas on sticky notes to working software prototypes and virtual models in several weeks. We are eager to continue our work on Seamless and Intuitive USW. In addition to being an excellent platform for idea formation, this project was fun, exciting, and served as a vehicle to achieve our objective of developing the next generation of “system of systems” engineers. Working with next-generation technology is always a pleasure, and the expectation that our ideas will make it onto a shipboard system and help sailors perform their functions better makes our work even more worthwhile. Matt Puterio is an engineer in the Sensors & Sonar Department and has been with NUWC Newport since June 2012 after graduating with a degree in Computer Engineering from the University of Delaware. His work includes test and analysis on the SQQ-89/ACB-13 surface ship sonar program and also works with Ray Rowland on the Seamless & Intuitive USW program.